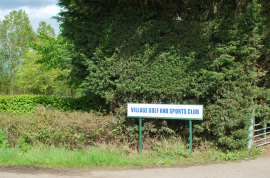 One of Staplehurst’s best kept secrets, Village Golf Club is a 9-hole, 29 par, pitch and putt style golf course set in attractive parkland on the outskirts of the village. The course can be played by all standards. Whilst it is perfect for junior players and those new to the game, the tree lined fairways demand accuracy. This makes it ideal for the more experienced player who wants to improve their short game, or who simply wishes to fit in a quick round at the weekend or after work. Membership is very affordable. For example, our 7-day adult membership is £115 per year, which works out at only £2.21 per week. Although the club is open to members only, for a minimal £5 charge, guests accompanied by a member are very welcome. The atmosphere is relaxed and informal. The setting is quiet and tranquil (apart from the occasional passing train) and is especially beautiful in spring and autumn. Facilities are limited; there is no clubhouse, but there is a toilet and ample parking spaces are available.